A major earthquake has hit northern Afghanistan this morning. It was also felt in Pakistan and northern India. According to the US Geological survey, the earthquake had a magnitude of 7.7 and was centered in a mountainous region 158 miles north-east of the Afghan capital of Kabul at a depth of 133 miles. It occurred at around 2:10 p.m local time (5:10 a.m. ET). Associated Press reports that tremors were felt in Kabul for 45 seconds. Power has been cut and telephone lines are down. 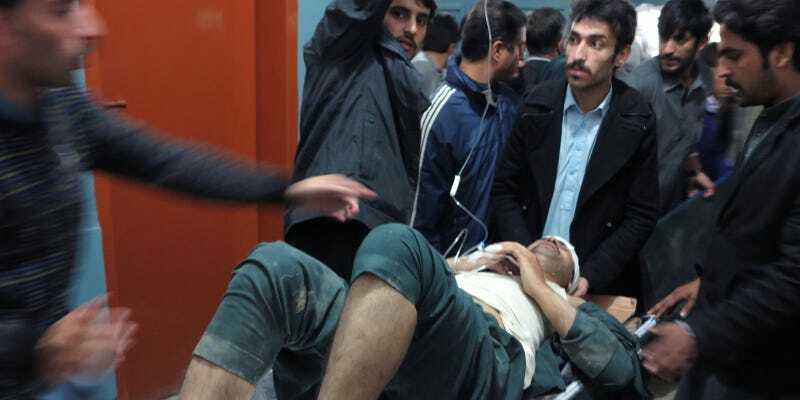 The provincial director of the national disaster management authority, Abdullah Humayoon Dehqan, has told the Associated Press that “there are reports of casualties and destruction” in some parts of Afghanistan. Update 7:03 AM ET: Reports of injuries and deaths are starting to appear online. So far, the Guardian reports, there have been: five deaths and 55 people injured at Nangahar provincial hospital in Afghanistan; 12 deaths and 30 injuries at a girls’ school Takhar province in Afghanistan; 12 people killed and 50 injured in the northwestern region of Pakistan. The figures are expected to rise. Update 7:54 AM ET: The Guardian is now reporting that at least 43 people have been killed in Afghanistan and Pakistan. Experts have been pointing out that because communication links appear to have gone down in many of the the worst-affected regions, it’s unlikely that the true impact will be revealed for some time. Reports suggest that the quake was felt in in the Pakistani city of Lahore and the Indian capital Delhi. As yet there are no official statistics about casualties. However, NBC News does point out that that the quake comes just days after extensive rains across Afghanistan, which will have made mud-built houses and buildings with shallow foundations more susceptible to damage. In 2005, a 7.6 magnitude earthquake struck nearby Kashmir killing at least 75,000 people. Earlier thus year, Nepal suffered a 7.8 magnitude quake that claimed 9,000 lives. This news is breaking. We’ll update it as we learn more. Top image by AP. Map by USGS.